Motorcycling is one of life’s great thrills, but getting your first bike can be intimidating. That’s why Yamaha created the YZF-R3—it’s a beginner-friendly package that still offers the styling and joy of a proper sportbike. 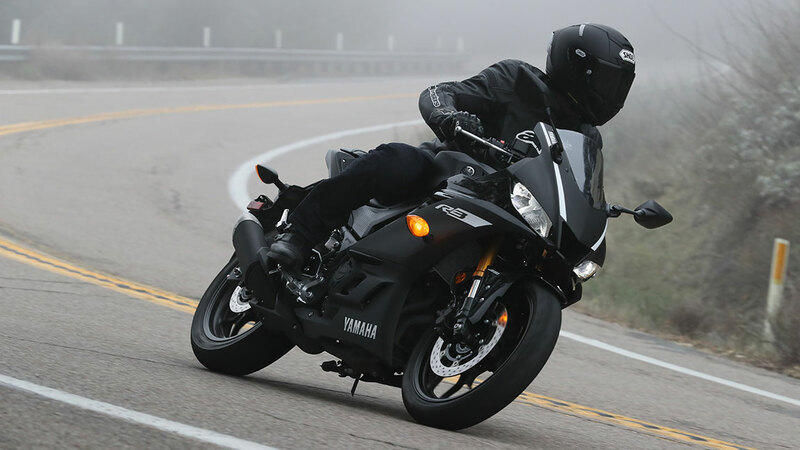 The R3, introduced in 2015, quickly became Yamaha’s best-selling bike in the United States due to its light weight, ample power, and easy handling. There were a couple of minor flaws with budget components, but the good news is that Yamaha has addressed them with an update for 2019. The most obvious change: the styling, which includes new bodywork, LED lighting, and LCD gauges. The facelift does a wonderful job of emulating the bigger R6, R1, and even the YZR-M1 racebike piloted by Valentino Rossi in MotoGP, the world’s greatest motorcycle road racing competition. When Yamaha starts a model name with “YZF”, it means it’s suited for the street and the track, and the R3 is no exception. For 2019, the handlebars are almost an inch lower than before, and it strikes the perfect balance between commuting comfort and racetrack aggression. There’s a popular saying in motorcycling: “It’s more fun to ride a slow bike fast than a fast bike slow.” The new R3 is one of the best examples of that maxim we’ve encountered. 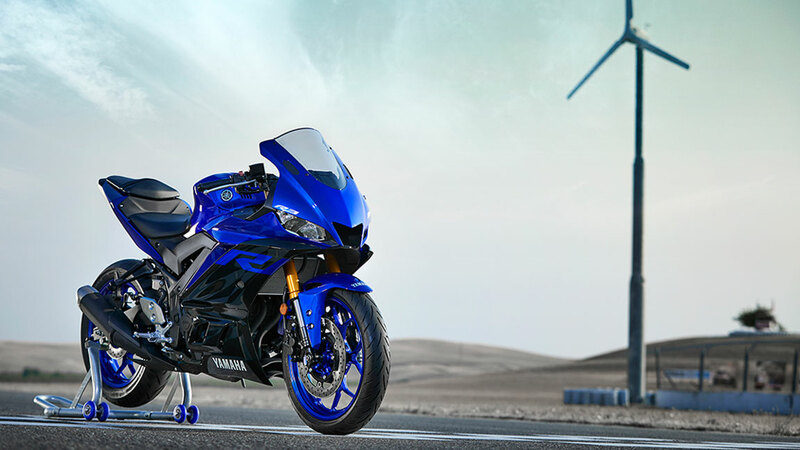 Whether you’re carving your local corners or on the track, you’ll feel the sportbike DNA of the rest of Yamaha’s R family. Wind the 321cc motor up and a shift light will remind you that it’s time to click the six-speed transmission into the next gear, while a redesigned fuel tank makes it easier to hang a knee off in the corners or to tuck in behind the windscreen. The R3 has been a popular entry for club racing since its introduction for good reason, and the new bike is even better. Newly fitted Dunlop radial tires are a huge improvement over the old bias-plys, and the suspension is now significantly stiffer on both ends. Both upgrades are great news for riders who have more fun in the corners than on straightaways. Anyone can go fast in a straight line on a high-horsepower bike, but the beauty of the R3 is that it will help make you a better rider as you learn how to maximize momentum. Still, this little Yamaha is no slouch: 41 horsepower is more than enough to have fun when your motorcycle weighs just 368 pounds (add seven for anti-lock brakes). You don’t have to be riding aggressively to enjoy the R3, though. Thanks to excellent gas mileage (56 mpg), short-for-a-sportbike seat height, and a digital gauge cluster, it’s also a competent commuter that will ensure you show up for work in a good mood. As a bonus, the passenger seat is much larger and more comfortable than what you’ll find on the R6 or R1—something your companion will appreciate. As a mid-cycle refresh, the new R3 is one of our favorite entry-level motorcycles. At the same price: Kawasaki’s Ninja 400, which was completely revamped last year, offers a bigger motor for $4,999 (add $300 for optional ABS). With that said, you don’t buy a bike like this for pure acceleration or top speed. The Yamaha is fun in the corners thanks to the upgraded suspension and more aggressive riding position. It’s an excellent way to get to work or start your path to be the next Rossi—either way, you’ll have a smile on your face. The R3 is available in your choice of Team Yamaha Blue, Vivid White, and Matte Black, though if you want ABS (which you should), you’ll be limited to the latter two options. It’s currently available at your local Yamaha dealership, and you can even get instructional seat time through the Yamaha Champions Riding School.